BMW Sauber's new F1.08 does not sport anything revolutionary, but the development has taken a huge leap over the winter. The sidepods have been the main focus of attention. 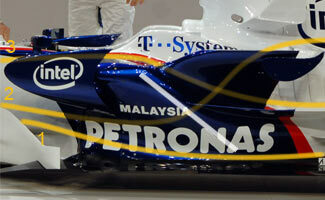 The image clarifies the aerodynamics around and inside the sidepod by yellow flowlines. First of all, the undercut has been deepened to allow more air to flow smoothly around the pod and onto the diffuser and rear wing (1). The same goes for the airflow over the sidepod (3). Intelligent placing of the cooler in the sidepod (white) allowed the aerodynamics to seriously slim down its volume towards the rear, increasing the overall efficiency of the car. The thing that stands out to me is the placement of the \'mid-wing\' on the F1.08. On other cars it is placed at the end of the engine cover, but you can see (especially on 3/4 views) that the mid-wing is further up the chassis and connected to the chimney. Pretty interesting. Tomba, any insight? ?